Stuck in Siena | Help! I live with my Italian mother in law! First of let me just say that I can think of much worse places to be stuck. Seems that my optimism and my inner goddess-Pollyanna, got the better of me. (If you haven’t read Fifty Shades of Grey then the goddess remark might swim over your head, sorry). Up to the point of arriving in Siena via the cow path from Florence, I was praising the coach bus drivers for not striking like the bastards at Trenitalia…I know, I even, dare I say, got a bit cocky for outwitting them at their own game. Until…yeah, you guessed it, the coach bastards announced they were also striking starting 10 minutes after I arrived in Siena! Cazzo. Plan B, oh I didn’t actually have a plan B did I? Defeated, I started walking back to the train station when I happened upon an oasis in the Tuscan heat…an air conditioned bar! I slipped in and ordered a tall glass of fizzy water with loads of ice. I need to clear my head from all this fuzzy Italian nonsense. Think Leah, think. I asked the barman for a taxi number. I called, how much does it cost for a taxi to Montefollonico? 130€, ahem, could you repeat that please, I don’t think I heard you correctly. Gasp. The barman replied, oh dear, it is cheaper to sleep here and try again in the morning. Perhaps, but only if I find a cheap hotel. And so I did! Alma Domus, single room, under 50€ including breakkie. With a new plan at hand I called, made a reservation and set out walking. I even had a map that two Swedish girls gave me when I used my iPad to help them find something. All was well except that I was also using a gps system to find this small side road and subsequently got very lost. Tired and spent, I stopped a woman on the street and asked for directions. Lo and behold, she went and got her husband and offered to take me there! Awesome! Not to waste a good opportunity, I found a nice Tuscan restaurant and tucked into some yummy bruschetta and papparedelle pasta with wild boar sauce. The place is hidden away and I almost didn’t find it! It’s called Osteria il Campaccio and the price was good, the service was excellent and the food devine. 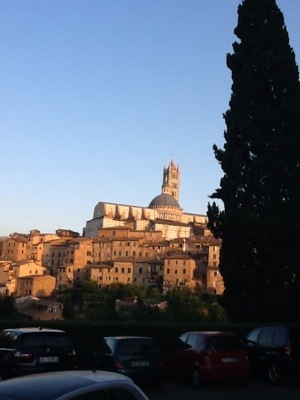 If you ever find yourself stranded in Siena check it out, it is around the corner from Basilica San Domenico. This entry was posted in Food, Italian Culture, Tourists, travel and tagged sciopero in tuscany, Siena, sita, strike, trenitalia. Bookmark the permalink. 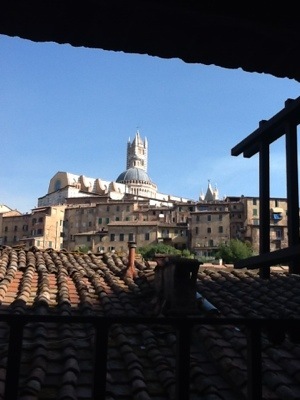 …go see the frescoes in the side room second on left inside the duomo… best in Italy! Incredible colours, 3D effect just awesome! Pingback: From Tuscan towers and the top of the world! | Help! I live with my Italian mother in law!